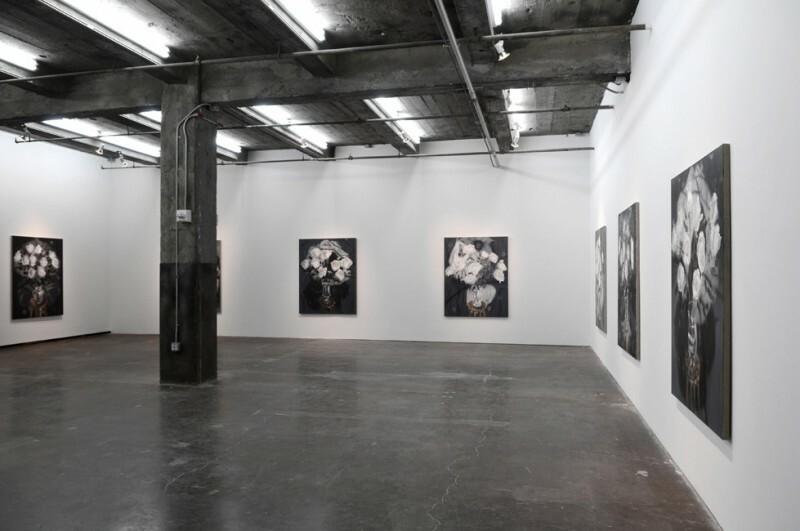 Maccarone Gallery is pleased to present “Flowers”, an exhibition of new paintings by Ann Craven. 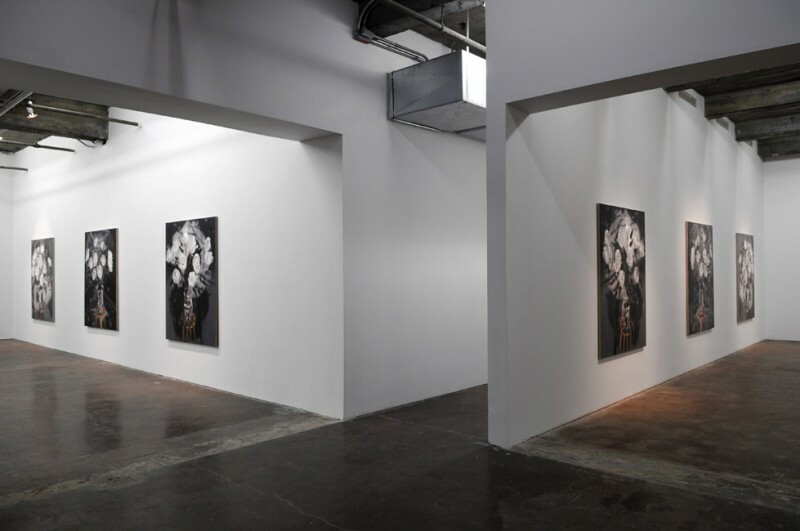 In previous work, Craven has explored symbolic images such as birds, deer, and the moon, pulled from thousands of her collected print outs, images she scanned and printed from nature books and magazines or gathered from the internet. 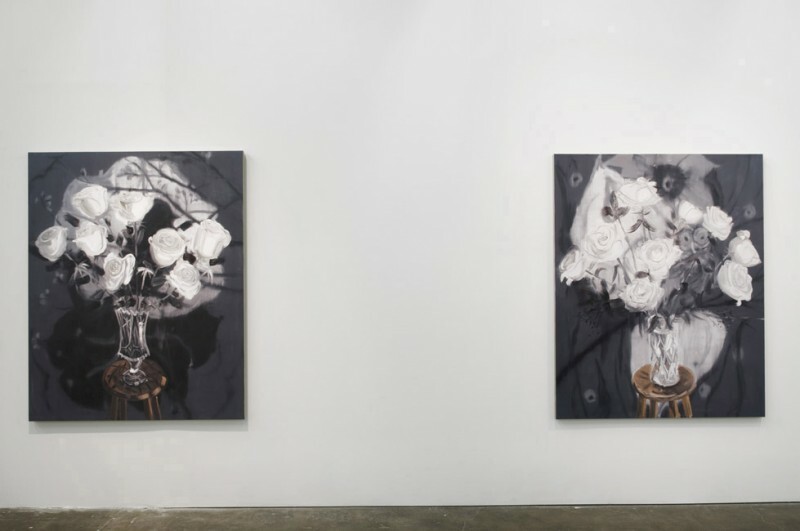 In her first solo exhibition at Maccarone Gallery, the artist undertakes a new subject, still-life arrangements of white roses, painted from life. 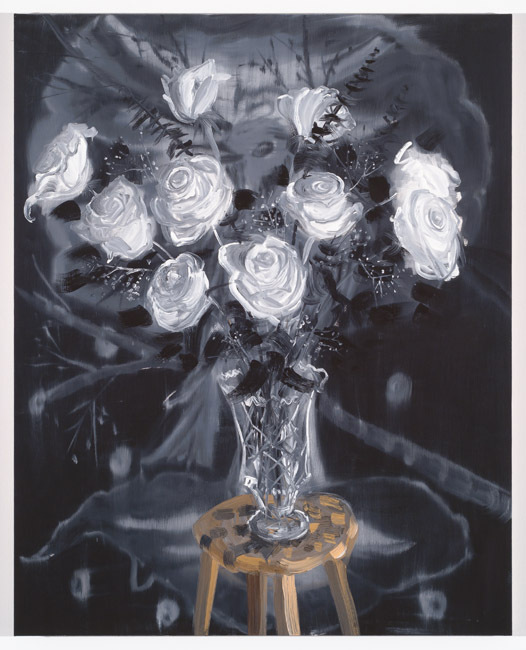 Painting with bravura improvisational intensity, and using primarily a palette of black and white, Craven reanimates the anachronistic genre of still-life flower-painting. Craven began painting flowers from observation several years ago when, following the death of a loved one, she made paintings of the roses taken home from the funeral as gifts for her family. From the start, she approached the subject with a deep intuitive connection to both the historical and popular symbolism of the rose. The paintings in this exhibition build on this symbolism, immersing us in a dramatic black-and-white world of fluid scale, where rose petals become spiraling, almost galactic form, slashes of black paint, depicting rose leaves, become swift-moving vectors, and dashes of white, used to represent baby’s breath, suggest clusters of stars. 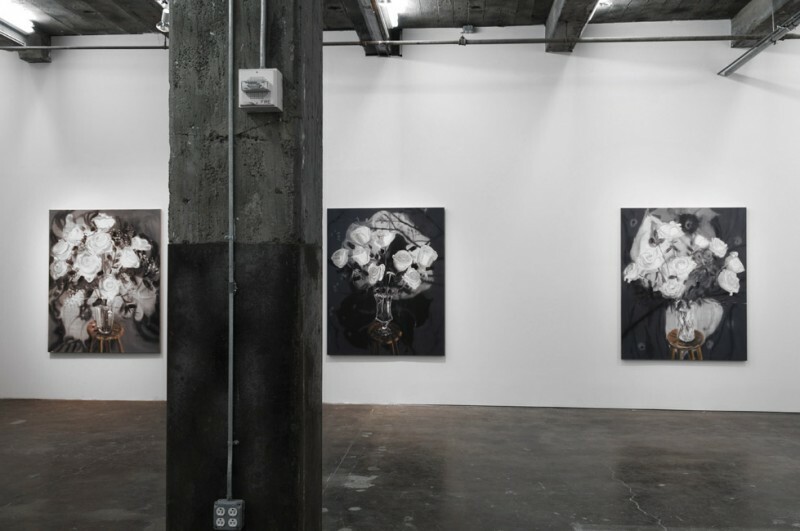 The exhibition is organized around three groups of paintings, each installed in a separate part of the gallery. The first room contains a series of nine paintings of bouquets of white roses in glass or crystal vases situated on a simple studio stool, all painted from observation. 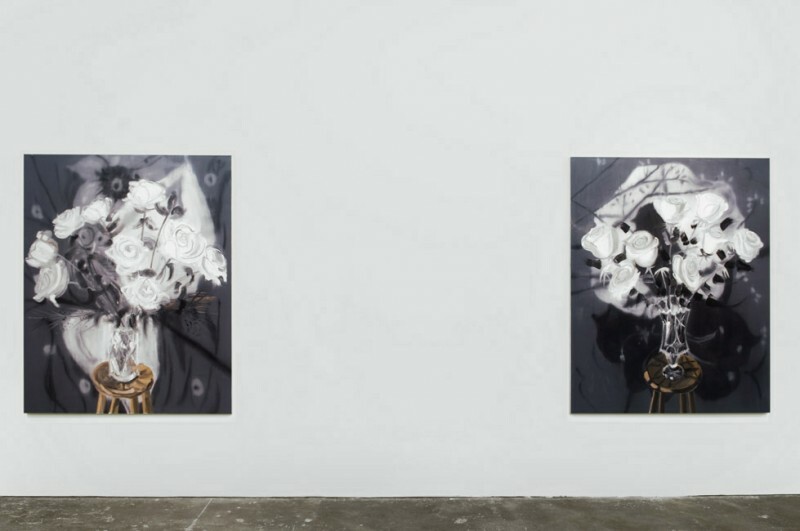 For the backgrounds, Craven uses flower motifs redeployed from her previous paintings, making these new paintings, in effect, flowers on flowers. In the second room are “copies” of the paintings in the first room. The copies are mirror images of the “original” paintings, flipped left to right along their vertical axes. The copies are installed in clockwise rotation, also mirroring the counter-clockwise rotation of the paintings in the first room. Around the street-facing perimeter wall of the gallery, Craven has installed her “stripe paintings” – that she makes using the paint left over on her palette after completing each painting. 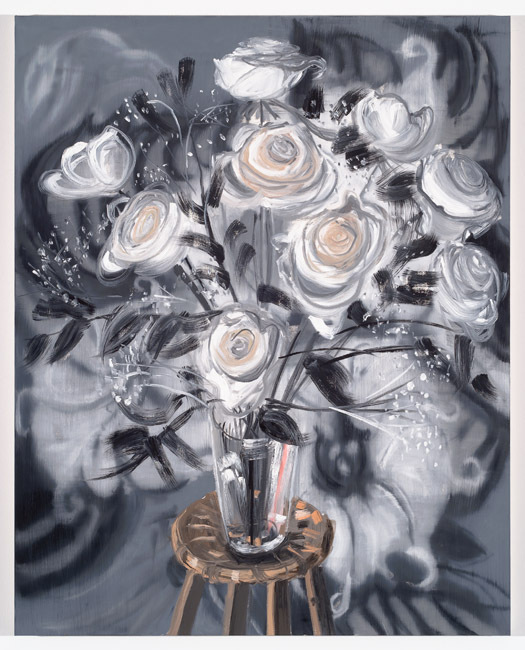 Craven considers these stripe paintings to be “born” from the flower paintings and refers to them as a third set of flowers. Craven’s paintings — the originals, mirrored copies, and stripes — raise complex questions. What exactly occurs when Craven makes a mirrored copy, stroke for stroke, of an original, painted alla prima from a three-dimensional motif? The spontaneous, focused gesture is repeated and thus reified, an image of an object becomes a mirror image of an image. The improvisational brushstroke, usually considered a recording of a unique movement of a body in time, is re-performed, becoming choreographed. With the stripe paintings, representation and execution are still further reified. Left-over paint, applied in parallel brush strokes, becomes another sign for a bouquet of flowers. 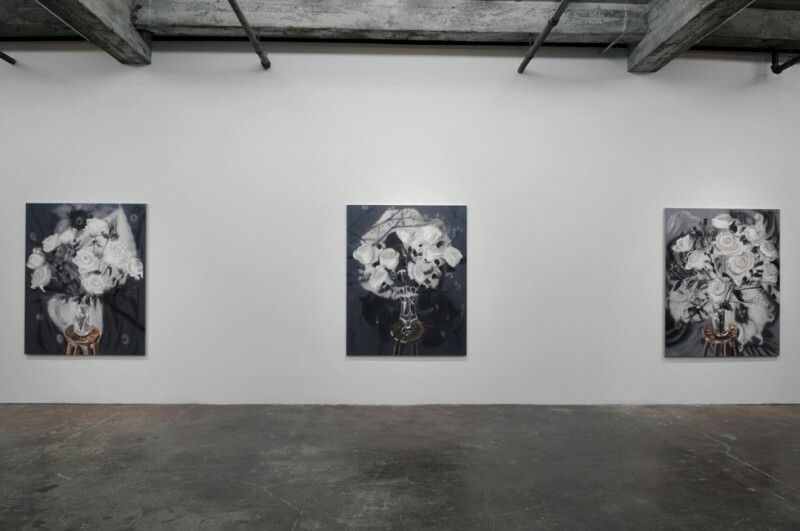 *Bianca Beck and Josh Brand, On Ann Craven, or Painting Again: Memory, Mirror, Moon, March, 2008.